How do I become a 2019 Ribfest Sponsor? Ribfest was voted Guelph's Favourite Festival! A Guelph Ribfest Sponsorship 2019 ensures you are investing in the best. 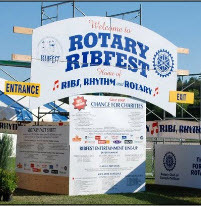 22 Years of Ribs, Rhythm & Rotary! The community benefits when we collaborate. Working together, corporate sponsors like yourself. Trillium, and the 50,000+ people who attend Ribfest every year provide thousands of dollars to a variety of charities in our community. You’ll be visible to over 50,000 attendees for only $600+ over your sponsorship level. Tents are available. To add vendor space to your sponsorship contact the Guelph Ribfest Sponsorship Committee. Download a PDF on Guelph Ribfest Sponsorship. Ready to be part of Guelph’s Ribfest? Please contact the Guelph Ribfest Sponsorship Committee to become a part of this great event! Join the fun... there is much to offer for the whole family!